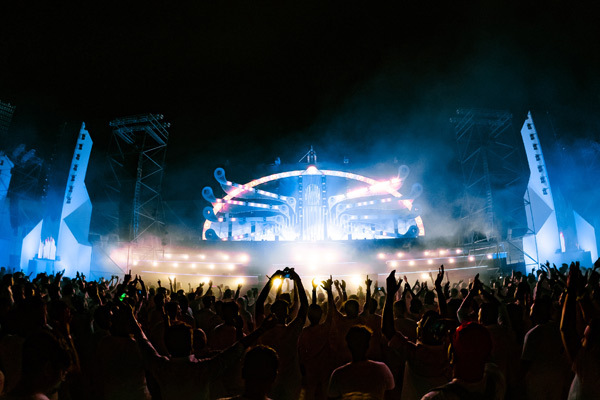 MUMBAI: Visually enthralling lights, euphoric beats of EDM, Budweiser and a crowd dressed in white, Hyderabad danced to the dope beats at Budweiser Experiences presents Sensation Rise 2018 on last Saturday. Hosted at Gachibowli Stadium, the biggest electronic dance music festivals saw mind-boggling performances by international DJs like Sam Feldt, Robin Sculz, Nickey Romeo, Sander Van Door, Mr White, WhoIsJody and our very own Indian DJ Nucleya. Dressed in white, the whole arena sparkled in the spirit of harmony and oneness. The crowd went berserk as the DJs played some world famous electronic dance beats. It seemed like the music gods had lined up to bless their EDM crazy fans with a sensational night that had an equally visually enthralling lights and firecracker display. People, who attended Budweiser Experiences Sensation Rise 2018 had no words to describe this sensational event that gave everyone the feel of Tomorrowland. Thus, you can say, we had our Indian version of Tomorrowland that was no less than the original festival, when it came to euphoric EDMmusic, spectacular visual display and of course the energy of crowd, which elevated throughout the event. While the Budweiser Maze gave fans a chance to get their customised festival merchandise as they captured their favourite moments from the event, the selected few got a chance to experience the luxurious hospitality of Budweiser at Sheraton Hyderabad Hotel. Both media and bloggers across the country also cherished the lavish world class stay at the hotel, organised by Budweiser, while getting Budweiser goodies and loads of Bud as a token of welcoming them to Bud’s huge family. From pre-party lunch to the actual event and the equally crazy after-party, Budweiser Experiences ensured that they were the perfect host for both their special guests and the crowd of about 18,000 EDM lovers, who attended the vibrant dance festival. To sum up, Budweiser Experiences Sensation Rise 2018 was one of its kind dance music experiences for Indian fans, who witnessed a night of dope music and of course Busweiser. MUMBAI: Sunburn 2018 wrapped with a big bang and the vibe was just brilliant. The makers indeed put in their best and the festival turned out to be a big musical treat. Sunburn Festival 2018 all set to enthral EDM lovers in Pune today as High Court gives green signal! MUMBAI: The 2018 edition of India’s biggest musical extravaganza, Sunburn Festival will kick-start today in Pune. MUMBAI: Tokyo based future house bass music producer VIVID has released a euphoric new single on Hardwell’s brand new label Gemstone Records. Tomorrow Land DJ DC Salas celebrates 'The Belgian King's Day' in Mumbai, calls it an 'intense' city! MUMBAI: The Belgian King's Day was celebrated in Mumbai with music, fashion, and food showcasing the essence of Belgium, this year, shouting loud of the theme 'From Belgium to India with Love’.